An overview of the roads and freeways serving the Tri-Cities of Washington. Washington 397 spans the Columbia River across the Ed Hendler Bridge. Locally known as the Cable Bridge, the span was the second largest concrete cable-stayed bridge in the world. Photo taken August 28, 2006. Interstate 82 was originally touted to run through Richland and Pasco of the Tri-Cities and along the east side of the Columbia River to Wallula. Changes were made in July 1969 to route the freeway west of the area en route to Umatilla, Oregon with the provision that the Tri-Cities be joined with I-82 via a freeway spur (Interstate 182). Today Interstate 82 remains vastly rural, carrying four lanes from Horse Heaven Hills to Benton City and Kiona on the western outskirts of Kennewick and Richland. U.S. 395 and U.S. 12 share stretches of the freeway. Interstate 182 travels 15.19 miles from Interstate 82 at Goose Gap through Richland and Kennewick. The freeway doubles as U.S. 12 for its entire length. Completed in 1986, the route provides a high-speed route to Yakima Valley from the Tri-Cities. U.S. 12 follows all of Interstate 82 east from Yakima to Interstate 182 at Goose Gap. Interstate 182 dually carries U.S. 12 signage through Richland and Pasco, with U.S. 12 joining its original alignment from Lewis Street southeast to Burbank, Attalia Station and Wallula. The surface route of U.S. 12 utilized Lewis Street west to 10th Avenue and the Green Bridge across the Columbia River. Turning westward through Downtown Kennewick, U.S. 12 used Columbia Drive to Columbia Park Trail and Kennedy Road west. When Interstate 182 was completed by 1986, U.S. 12 was relocated to share pavement with the freeway. The Green Bridge, otherwise known as the Benton-Franklin Inter-County Bridge, opened on October 21, 1922 with private funding. The 23-foot wide span doubled as the Yellowstone Trail and was tolled until June 1931. U.S. 410 utilized the span until 1967 and U.S. 12 from 1967 until it closed on September 16, 1978, when the adjacent Cable Bridge was completed. The bridge sat unused for ten years until its demolition. U.S. 410 was replaced wholly through the Tri-Cities in 1967 with the western extension of U.S. 12 to the Pacific coast. The route utilized the U.S. 12 path along the Columbia River with U.S. 395 from Wallula to the Green Bridge between Pasco and Kennewick. The SR 240 freeway from Columbia Drive in Kennewick to Richland carried U.S. 410 to Columbia Park Trail and Kennedy Road through West Richland and Benton City. U.S. 395 follows Interstate 82 north from Umatilla, Oregon to Exit 113 at Kennewick. Turning northeast, the US Route follows a four-lane arterial through to the Blue Bridge across the Columbia River into Pasco. A brief overlap with Interstate 182 & U.S. 12 connects the U.S. 395 freeway from the Blue Bridge with the expressway leading northeast to Ritzville. Historically, U.S. 395 shared pavement with U.S. 410 / 12 along the east side of the Columbia River from Wallula northward to Lewis Street in Pasco. Following North 4th Avenue, U.S. 395 joined Oregon Street for an exit of Pasco. When Interstate 82 was completed in 1985, U.S. 395 shifted from the eastern alignment to an overlap with the freeway and current alignment. Washington 12 began in Kennewick and ran southward to Plymouth and westward along the Columbia River to U.S. 97 at Maryhill. The state route was renumbered to Washington 14 when U.S. 12 was extended west over U.S. 410 in 1967. SR 12 utilized Bofer Canyon Road north over Horse Heaven Hills to Southridge Boulevard and Union Street through south Kennewick. Completion of Interstate 82 overtook the original SR 14 alignment, resulting in the truncation of route to Exit 131 near Plymouth. Webber Canyon Road ties into the Exit 96 diamond interchange of Interstate 82 & U.S. 12 at Benton City to form the eastbound beginning of Washington 224. Photos taken 08/31/06. Washington 224 (1st Street) passes under Interstate 82 & U.S. 12 and reaches the westbound on-ramp to Yakima Valley. Photo taken 08/31/06. Adjacent to Interstate 82 is the split of Washington 225 (1st Street) north from Washington 224 (Kennedy Road) east. Washington 224 continues 10.06 miles east to West Richland and Washington 240 in Richland. Photo taken 08/31/06. Washington 224 overtakes Washington 225 along 1st Street in Benton City and quickly ends at the eastbound on-ramp to Interstate 82 & U.S. 12. Weber Canyon Road begins and ascends Horse Heaven Hills. Photo taken 08/31/06. The first shield of Washington 225 resides just beyond the split with Washington 224 (Kennedy Road). Photo taken 08/31/06. Washington 225 (1st Street) spans the Yakima River on the Benton City - Kiona Bridge. The 400 foot long steel box girder bridge opened in 1957 and is on the National Register of Historic Places. Photos taken 08/31/06. Facing east from the Benton City - Kiona Bridge over the Yakima River. Washington 224 travels just above the east banks of the waterway. Photo taken 08/31/06. Remnant bridge supports remain in place just west of the SR 225 Yakima River span. A cut reveals the path of Interstate 82 & U.S. 12 beyond the river bend. Photo taken 08/31/06. Washington 225 (1st Street) approaches both the Benton City - Kiona Bridge and Washington 224 (Kennedy Road). Photo taken 08/31/06. A steel box girder bridge carries Washington 225 motorists across the Yakima River. The 400' span opened to traffic in 1957. Photos taken 08/31/06. Washington 225 ends at the Washington 224 turn from Kennedy Road onto 1st Street adjacent to Interstate 82 & U.S. 12 (Exit 96). SR 224 joins Benton City with West Richland and Richland on a 10-mile course. Photo taken 08/31/06. Reassurance shield for Washington 240 east posted after the signalized intersection with Duportail Street along the Bypass Highway southbound in Richland. Photo taken 08/28/06. Approaching the intersection with Aaron Drive and Interstate 182 & U.S. 12 on Washington 240 (Bypass Highway) east. Photo taken 08/28/06. Aaron Drive acts as a northbound side frontage road to the freeway east to Wellsian Way and George Washington Way. Photo taken 08/28/06. The right lane defaults onto Interstate 182 & U.S. 12 west to Interstate 82 at Goose Gap. Photo taken 08/28/06. Washington 240 merges with Interstate 182 & U.S. 12 east beyond the intersection with Aaron Drive. A trumpet interchange joins the two divided highways. Photo taken 08/28/06. Continuing south from I-182 & U.S. 12, Washington 240 approaches the Yakima River bridge. A truss bridge parallels the freeway along the US Government Railroad line from Hanford. Photo taken 08/28/06. 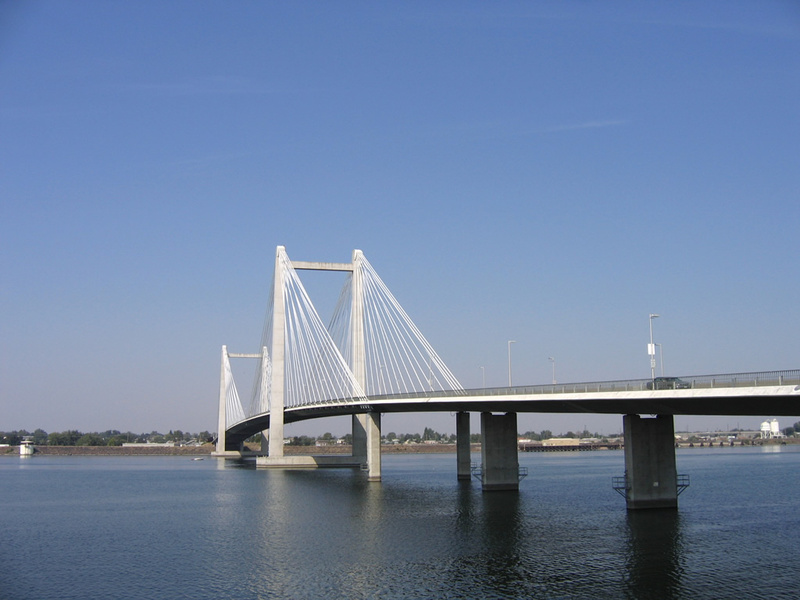 An eight-lane span replaced a four-lane 1950s-built bridge when it opened in 2005 as part of the overall SR 240 expansion project. Photo taken 08/28/06. Major road construction along Washington 240 focused on a relocation of the freeway mainline over Columbia Park Trail and redesign of the Richland Y Interchange. A roundabout was added between the eastbound off and on-ramps with Columbia Park Trail and Steptoe Street leading south to Gage Boulevard. Columbia Park Trail is the old alignment of U.S. 410 and U.S. 12 between Richland and Kennewick. Photo taken 08/28/06. Washington 240 turns east from the Richland Y community along side Columbia Canal. Photo taken 08/28/06. Columbia Center Boulevard meets the SR 240 freeway at a six-ramp parclo interchange in one half mile. Photo taken 08/28/06. Columbia Center Boulevard ends at Columbia Park Trail and Island View to the north. Columbia Park Trail continues east to Columbia Park. Photo taken 08/28/06. The first of three Kennewick exits departs Washington 240 east for Columbia Center Boulevard. The north-south arterial ventures south to Columbia Center Mall and the Toyota Center and Arena nearby. Photo taken 08/28/06. Eastbound drivers cross into the city of Kennewick a short distance east of Columbia Center Boulevard and this shield assembly. Photo taken 08/28/06. The next exit along SR 240 eastbound joins the freeway with Edison Street in one half mile. Photo taken 08/28/06. Edison Street leads south from Columbia Park to a diamond interchange with SR 240, the West Highlands neighborhood and 10th Avenue. Photo taken 08/28/06. The last eastbound shield for Washington 240. A Union Pacific Railroad line will parallel the final approach to U.S. 395. Photo taken 08/28/06. Washington 240 concludes its 41.31-mile route at U.S. 395 and Columbia Drive east near the Blue Bridge. Photo taken 08/28/06. Columbia Drive begins from the SR 240 freeway end and travels east to the Kennewick city center. The surface boulevard represents the historical alignment of U.S. 410 to where the Green Bridge was once situated. Photo taken 08/28/06. Washington 240 ends at the partition of traffic to U.S. 395 north to Pasco, Columbia Drive East to SR 397 and the Cable Bridge and U.S. 395 southwest through Kennewick to Interstate 82. A major revamp of this interchange was completed in October 2009 that redesigned the junction. Loop ramps were replaced with roundabouts and the U.S. 395 overpass at the partial wye interchange with SR 240 west was replaced. Photo taken 08/28/06. A historical look at the former westbound beginning of Washington 240 from U.S. 395 south. Traffic from the Blue Bridge joins the SR 240 freeway west from a partial wye interchange ahead of the merge with Columbia Drive west. Work completed in October 2009 redesigned the exit ramp from U.S. 395 to SR 240 to depart from the right as opposed to the left. Photo taken 08/28/06. Immediately west of U.S. 395 is the westbound off-ramp to Columbia Park. Photo taken 08/28/06. Columbia Park Trail begins in Columbia Park and lines Lake Wallula of the Columbia River west to Richland. Access to this stretch of the scenic drive is only provided from Washington 240 westbound. Photo taken 08/28/06. Edison Street meets Washington 240 at the next exit. A diamond interchange joins the two roads between a Union Pacific Railroad line and Columbia Park. Photo taken 08/28/06. Westbound at the Edison Street off-ramp on SR 240. Edison Street stems south from Columbia Park Trail to the West Highlands community and 10th Avenue in Kennewick. Photo taken 08/28/06. Reassurance shield posted for Washington 240 westbound as the freeway approaches the Richland city line. Photo taken 08/28/06. Columbia Center Boulevard crosses paths with Washington 240 at a six-ramp parclo interchange next to Island View and Richland Junction in one half mile. Photo taken 08/28/06. Motorists bound for Columbia Center Mall and the Toyota Center and Arena depart the westbound freeway for Columbia Center Boulevard southbound. Photo taken 08/28/06. Columbia Park Trail continues west from the Richland Y community to a 2007-revised parclo interchange with Washington 240. The road leading west through Richland is the former alignment of U.S. 410 and U.S. 12. Photo taken 08/28/06. Work completed in 2007 realigned SR 240 at the Richland Y Interchange. Roadways were constructed east of the original freeway footprint to accommodate a new roundabout between Columbia Park Trail, ramps on SR 240 east and Steptoe Street south. Photos taken 08/28/06. Washington 240 turns northward to cross the Yakima River and merge with Interstate 182 & U.S. 12 west. Eight lanes cross the river on bridges built in 2005 as part of an overall SR 240 expansion project. Photo taken 08/28/06. George Washington Way commences from the directional cloverleaf interchange between Interstate 182, U.S. 12, and SR 240, northward to the Richland city center. Photo taken 08/28/06. Paralleling the Yakima River crossing of Washington 240 is a Government Railroad truss bridge to the west. Photo taken 08/28/06. All traffic bound for Interstate 182 & U.S. 12 departs in unison from the Washington 240 freeway at the George Washington Way off-ramp. Interstate 182 & U.S. 12 share 15 miles of pavement from Interstate 82 at Goose Gap to Lewis Street in east Pasco. Photo taken 08/28/06. Washington 240 emerges from the Aaron Drive overpass to join traffic from Interstate 182 (Exit 4) east as the six-lane Bypass Highway. Photo taken 08/28/06. Vantage is a 68 mile drive to the north from Interstate 82. West Richland lies five miles to the west via Washington 224. Photo taken 08/28/06. Duportail Street intersects Washington 240 (Bypass Highway) at the first traffic light of the state route westbound. The residential through street connects with Thayer Drive to the east. Photo taken 08/28/06. Washington 240 (Bypass Highway) westbound at Duportail Street. Duportail Street also exists to the west of Yakima River. Photo taken 08/28/06. Washington 397 reassurance shield posted after Columbia Drive as the state route passes by the Vietnam Veterans Memorial. Photo taken 08/28/06. Approaching the cable-stayed Ed Hendler Bridge (Cable Bridge) on Washington 397 north. Photo taken 08/28/06. The Cable Bridge carries Washington 397 north from Kennewick to Pasco across Lake Wallula of the Columbia River. Photo taken 08/28/06. The Cable Bridge carries four overall lanes and sidewalks along both directions of Washington 397. The 80-foot wide bridge utilizes a 2,503-foot continuous girder. Photos taken 08/28/06. Washington 397 touches down at the South 10th Avenue intersection with West Ainsworth in Pasco. The state route turns eastward and follows Ainsworth to South Oregon Avenue. Photo taken 08/28/06. Washington 397 south leaves the Cable Bridge for Gum Street at the ramp to Columbia Drive west. Columbia Drive leads through the city center to the interchange between Washington 240 and U.S. 395 at the Blue Bridge south end. Photo taken 08/28/06. The Cable Bridge cost $23 million to build and was dedicated on September 16, 1978. Officially renamed in September 1995, the Ed Hendler Bridge honors the Pasco businessman and politician that spearheaded efforts for its construction. Lighting was added to accent the cables in 1998. Photos taken 08/28/06. An observation platform juts outs over the Columbia River from an adjacent multi-use path to provide these views east of the Cable Bridge. The pier utilizes an original support from the old Pasco-Kennewick Bridge. That bridge was demolished in 1990.1 Photos taken 08/28/06. South 10th Avenue northbound at Lewis Street in the city of Pasco. Lewis Street joins the city center with the Blue Bridge to Kennewick. Photo taken 08/28/06. Columbia Drive ventures east from the Washington 240 and U.S. 395 interchange through the center city of Kennewick. Many businesses line the boulevard between the Blue Bridge and Washington 397 (Gum Street). Pictured here is the intersection with Fruitland Street. Fruitland Street links downtown with Columbia Park, a pastoral area along the river, west of U.S. 395. Photo taken 08/28/06. Approaching the Columbia Drive traffic light with Clover Island Drive north and Washington Street south. A city-installed sign outlines the points of interest on the Clover Island. Photo taken 08/28/06. Washington Street continues Clover Island Drive south from Columbia Drive to West 27th Avenue. Photo taken 08/28/06. Columbia Drive motorists reach Washington 397 (Gum Street) at the south end of the Cable Bridge. Washington 397 links Kennewick with Finley to the south and the Pasco city center to the north. Photo taken 08/28/06. Westbound Lewis Street at South 20th Avenue. Photo taken 08/28/06. Lewis Street westbound defaults onto U.S. 395 southbound at the Blue Bridge. A partial "Y" dumps traffic onto the left side of the freeway. Photo taken 08/28/06. State Route 224 (Mark Bozanich). State Route 225 (Mark Bozanich). State Route 240 (Mark Bozanich). State Route 397 (Mark Bozanich). Page Updated October 10, 2011.